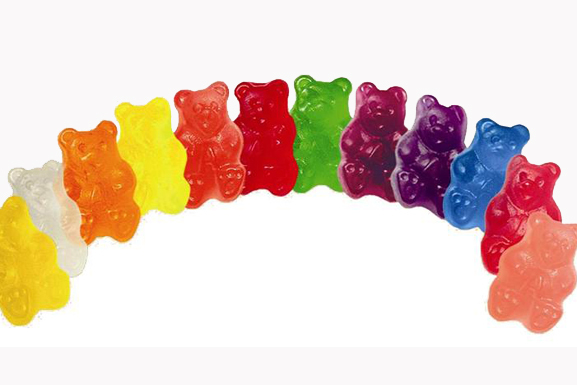 Home » 6to26Reviews » Albanese 12 Flavor Gummy Bears – The Best In The World? Albanese Gummies are the “best in the world”. According to them. Let’s check it out, shall we? For the record, here are the correct flavors: lemon, wild cherry, orange, pineapple, strawberry, apple, banana, lime, watermelon, red raspberry, grapefruit, and grape. Hey, no one’s perfect, right? We got a few right. Give these things a try. They’re juicy, they’re well flavored, and they make my kid angry. Find them at oldtimecandy.com, along with a ton of other great candy, both old & new. Again, big props to Bob @ Oldtimecandy.com who hooked the Gurus up with a sample of these when we couldn’t find them locally. this is awesome! “i’m the head boss of me”. a quote for the ages! Man, it’s rough when Dad gives you TWELVE gummy bears to eat. …and then chides you for actually eating them! Boss vs. Head boss. Hard to argue with kiddie logic. Oh, wait…No, it’s not. LOVED THAT REVIEW! Jonah thinks this is ‘the most hilarious film I’ve ever seen’. Jr. is brilliant. I refuse to write/record another review until this stays up on the home page for at least another few days. It’s just too precious. Wait till he hits about 12, lol. It only gets harder, but sometimes you can get them to eat chocolate covered bacon. I wish we could get these in the UK. We have the “gourmet jelly beans” but not these and I love jelly babies! I love these, the only Gummi Bears I know that can equal up to Haribo (fresh in germany), when you compare them in the US, they win straight up with the greater assortment of flavors and the fresh texture that Haribo Bears lack after the transport. That said, I love both! omg these are the best! You say Albanese aren’t the best with such certainty that you must have another brand in mind. Please share. I would have said Haribo Gold Bears when this review was published. However, now I’d definitely say Haribo a Juicy Bears. The best, hands down.